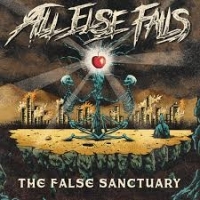 Formed in 2006, Canada's ALL ELSE FAILS has given us their latest single "Thrice Broken" from the album "The False Sanctuary" which was released December 13, 2018. ALL ELSE FAILS is putting their heart on their sleeve and stripping down the heavy guitars and pounding drums. Putting a passionate delivery about a dark truth out into the open. "Thrice Broken" is a very intimate song as the only sounds resonate from an acoustic guitar and a raw vocal. Sung in a manner that is both poetic and in the style of a conversationalist rant. The message is clearly spoken to you and not at you. Do not be quick to assume, this is no love song about some girl or a tantrum about how the world must be against you. My only gripe is that this is nothing that hasn't been done before. he only thing lacking is at the end when the rest of the band joins in to finish out the track is some sort of cinematic string ensemble. Maybe that is what sets them apart. It's a good song and the delivery seems sincere. If you are comfortable inside a box that consists of routine then "Thrice Broken" will not disturb your cycle. If you are a thrill seeker or have A.D.D., you will easily and quickly bore of this.